Arjun-Malaika relationship: Salman Khan to ban Boney Kapoor from visiting his home? Salman Khan, who has reportedly banned Arjun Kapoor from visiting home, may ban his dear friend Boney Kapoor as well because of Arjun's growing closeness with Arbaaz Khan's ex-wife Malaika. Arjun Kapoor and Malaika Arora may have been going strong in their relationship but it is affecting their family members and loved ones especially Arjun's father Boney Kapoor. If reports are to be believed, Salman Khan, who has reportedly banned Arjun Kapoor from visiting home, may ban his dear friend Boney Kapoor as well because of Arjun's growing closeness with Arbaaz Khan's ex-wife Malaika. In the past, Arjun Kapoor had irked Salman when the former left the latter's sister Arpita Khan after dating for a while. Arjun then started getting close to Malaika who was then married to Arbaaz Khan. Salman was quite angry about Arjun's behaviour and it was quite evident in his actions. It was also believed that Arjun's closeness to Malaika was a reason for her divorce from her husband. Sources even claimed that they saw Malaika and Arjun partying together and getting intimate at Mumbai's high-end restaurants. Reports had suggested that Salman had reportedly asked filmmakers not to cast Arjun in their films. Arjun had then convinced Salman that he would never do anything to hurt him and his family. 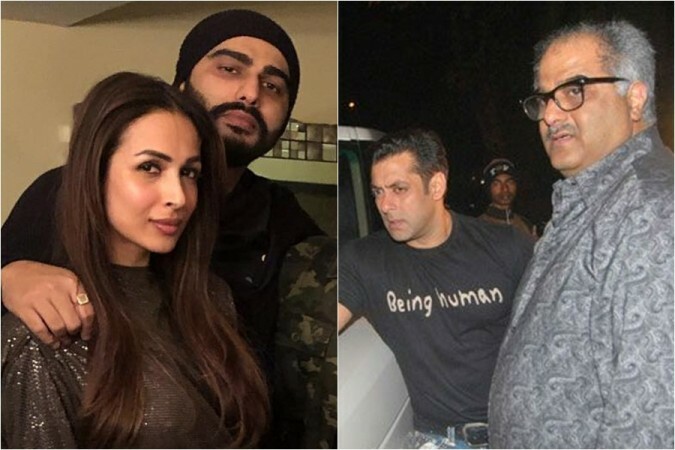 But it looks like Arjun's closeness to Malaika has once again annoyed Salman who apparently may ban Boney Kapoor from visiting his home as well. "Arjun first dated Salman's youngest sister Arpita. He broke up with her and became friends with Malaika Arora who was married to Salman's brother Arbaaz. That was when Salman began to get annoyed with Arjun. But the latter convinced Bhai that he would never do anything to hurt the Khan family. But after Malaika's divorce from Arbaaz, her public appearances with Arjun and whispers all around of their impending marriage, Salman is livid," a source close to Salman Khan's family was quoted as saying by Deccan Chronicle. Boney Kapoor, who is a close friend of Salman, had reportedly advised his son to stay away from Malaika as it was affecting their friendship. It is being said that Salman appeared in Boney Kapoor's film No Entry with charging any fee as the latter was going through financial crisis. A couple of years ago, Boney Kapoor had announced Wanted 2 and No Entry Mein Entry but Salman Khan was in no mood to dedicate his time to filmmaker. He had said that he is quite busy shooting for other projects like Bharat, Dabangg 3 and Sher Khan after Race 3. And now the question remains, will Salman Khan ban his good friend Boney Kapoor from visiting his home because of Arjun and Malaika's relationship? Only time will tell.